Our understanding of the evolution of hominins is largely based on direct evidence from skeletal remains (gait, brain size, mobility, diet, etc.) and material culture (bone and stone tools), and very little is known about their behaviour. Paranthropus robustus was a robust australopithecine that lived between 2 and 1.2 million years ago in South Africa and remains of this species have been found at sites like Kromdraai, Swartkrans, Drimolen, Gondolin and Cooper's Cave in the Cradle of Humankind.12 In the main, Paranthropus robustus was small statured but bipedal13 and followed a patrilocal form of residence14. They were dietary generalists.15 Apart from these main lines of evidence, very little is known about the behaviour of Paranthropus robustus during the Early Pleistocene. From an evolutionary ecological perspective, prey species develop mechanisms to avoid being caught by predators. These anti-predatory devices are varied in animals and behavioural and anatomical adaptations may include a combination of sound, smell, colour, pattern, form, posture and/or movement devices.2 Natural selection promotes the evolution in prey animals of features that reduce the probability of success for their predators. Animals with such anti-predatory devices tend to have a higher probability of escaping predation than animals without them.16 Today, lions (Panthera leo) and leopards (Panthera pardus) are the main predators of baboons. Lions stalk baboons during daytime when they feed on the ground, and leopards attack them during the night.17 Baboons have evolved numerous predatory avoidance behaviours to counter these attacks to ensure survival. The main behaviours include living in large troops, moving in a patterned way on the landscape5, using sentries (elderly male individuals to sound alarms and defend the troop), sleeping in inaccessible places at night18 and stone throwing19. It is likely that hominins employed similar behaviour by associating themselves with medium and large ungulates during daytime, especially before the controlled use of fire, which would have enabled them to successfully survive for several hundreds of thousands of years. However, testing this proposed association is challenging. For example, using a simple presence-absence approach with respect to medium to large Bovidae and Equidae faunas associated with Paranthropus robustus30-33 from the Cradle of Humankind does not reveal any significant absence of species (Figure 1). 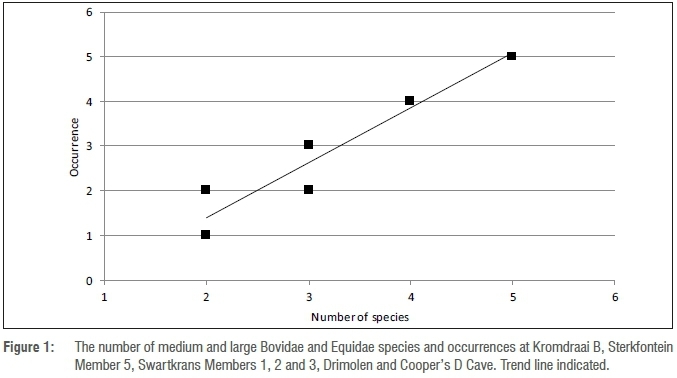 An absence or lower occurrence of species may indicate successful anti-predator behaviour, although sample size and taphonomic history34,35 are also important considerations. Novel approaches are required to investigate these likely associations between hominins and ungulates to reveal more about the evolution and behaviour of our human ancestors and their relatives. For example, a consideration of the predators, feeding and water requirements, habitat preference, distribution, herd size, home ranges, and anti-predator behaviour of ungulates can potentially reveal behavioural aspects of hominins like Paranthropus robustus and Australopithecus africanus to complement research on skeletal elements.